Lock in a great price for Napoli City Rooms – rated 8.8 by recent guests! The owner was very friendly and always take care of guest. Clean, comfortable, close to train station, staff very nice and helpful. Reviews were great on booking.com and visiting the property was even greater..... a 5 start bnb property. Very nice, spacious, extemly clean room. Double glazed throughout, all amenities one could possibly need! Ohhhh and a decent well set breakfast including fresh eggs, fresh croissants and daily fresly made pancakes!!! They do go the extra mile! Very welcoming!!!! Staff are very friendly. Close proximity to the train station for ease of access for travelling onwards. Sights in Naples centre are only about 10-15mins walk away. Comfortable bed and updated decor. Free breakfast was a nice treat. There are only 5 rooms in this hotel so there isn't lots of foot traffic going past your door. Massimo and Maria were the perfect hosts. Always on hand to offer assistance with information about Naples. The breakfast was plentiful for a continental one and hot drinks were available all the time. The modern décor was fresh and clean and the shower was lovely. The location was perfect for the railway station and the old city. The airport bus was only 2 minutes away and ran regularly. Great place to stay in Naples. We loved our stay at Napoli City Rooms. Massimo and his wife were the most welcoming hosts. Some reviews say that the location is a bit dodgy but we found it fine. Naples does have a kind of 'edge' to it in general so you just get used to it. Fantastic location for the trains, including the metro and local trains to pompeii, herculaneum and vesuvius. We came with 2 children aged 9 and 11 and felt very comfortable. Breakfast is simple (croissant, toast , cereals, fruit, yoghurt). On the corner of the street you can get the best sfoggiatella in Naples. 100% recommend for a mini break in Naples. Breakfast was on average, but offered a discrete choice and consider that in Naples is full of pastries to try out. Location is strategic, rooms are wide, modern and spotlessly clean. The staff also was very nice and kind, you can really see they do their best to make you feel comfy! I did like the room. The bed was very comfortable. The Hotel is very close to the train station just like 3 minutes by walk. Staff was very kind, friendly and helpful. Located in Naples, 1.6 miles from San Gregorio Armeno, Napoli City Rooms has a shared lounge, as well as free WiFi. The property is around 1.6 miles from National Archeological Museum, 1.7 miles from Chiesa dei Santi Filippo e Giacomo and 1.7 miles from Catacombs of Saint Gaudioso. A tour desk can provide information on the area. The rooms in the guesthouse are equipped with a flat-screen TV. Rooms are equipped with a private bathroom with a bidet, free toiletries and a hair dryer. All rooms at Napoli City Rooms include air conditioning and a desk. Capodimonte Astronomical Observatory is 1.7 miles from Napoli City Rooms, while MUSA is 1.9 miles from the property. The nearest airport is Capodichino Airport, 2.8 miles from the property. When would you like to stay at Napoli City Rooms? House Rules Napoli City Rooms takes special requests – add in the next step! Napoli City Rooms accepts these cards and reserves the right to temporarily hold an amount prior to arrival. 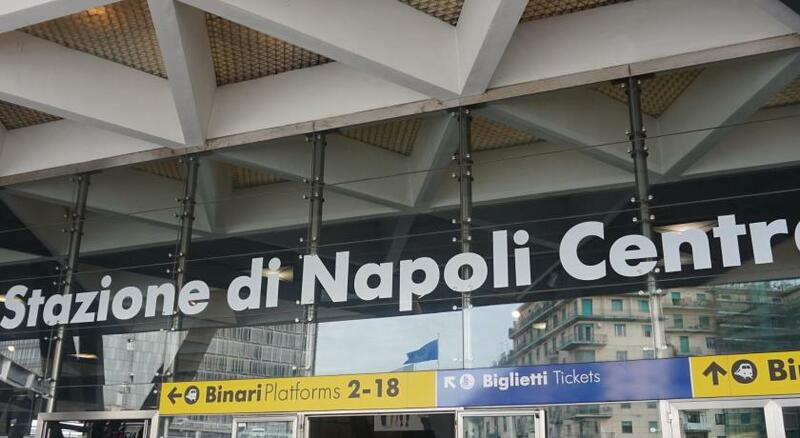 Please inform Napoli City Rooms of your expected arrival time in advance. You can use the Special Requests box when booking, or contact the property directly using the contact details in your confirmation. I did not like the breakfast at all. I expected more choices of the food and fresh pastry instead of bread toast...The bathroom was not that clean. Smell of cigarettes upon arrival at the hotel was not professional. the only thing i missed was a schuko plug for my laptop but i managed with the existing ones, not schuko. everything was great(wifi high bandwidth and stable , good breakfast , nice staff , clean room and towels, etc. ); some say location is in a bad neighbourhood but we walked the city a lot, and i have seen worst ones. this in in the piazza where is light and even cops walking by. still because it is in an inside court it is very quiet , no noise from outside. A lot of water goes on the floor from the shower. We got the room which is immediately on the check in desk / breakfast area which made me sceptical about noise but it ended up being ok as other guests were considerate. Great coffee at breakfast and helpful staff. The room was modern and clean. The only little thing that the door from the room leads directly to the hall and the voices are heard. The room was very nice and clean. We appreciated that the accommodation was very close to the station.